Published: Jan. 14, 2017 at 09:19 p.m.
Houston Texans quarterback Brock Osweiler finds tight end C.J. Fiedorowicz for the 10-yard TD. Published: Jan. 1, 2017 at 03:00 p.m.
Houston Texans quarterback Brock Osweiler connects with tight end C.J. 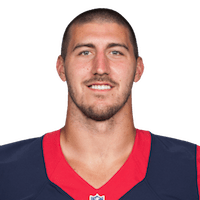 Fiedorowicz for a 4-yard touchdown. Published: Oct. 31, 2016 at 12:56 p.m.
Houston Texans quarterback Brock Osweiler hits tight end C.J. Fiedorowicz for a 6-yard touchdown. Published: Oct. 16, 2016 at 11:44 p.m.
Houston Texans QB Brock Osweiler hits tight end C.J. Fiedorowicz for a 26-yard touchdown to tie the game in 4th quarter.